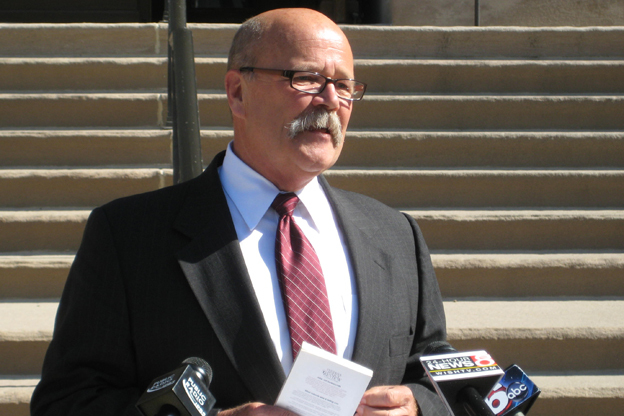 Democratic gubernatorial candidate John Gregg. One of the things that made news from the State of Education address is Tony Bennett’s request for a sped-up timeline for school-level takeovers and to create a similar system for district-level takeover. We’ve seen it in the legislature before. What are your thoughts about on this plan that it sounds like we’ll hear about in the legislature? GREGG: I’ve traveled around Indiana for 21 months, talked with teachers, parents, businesspeople — I’ve yet to meet a teacher that didn’t want our schools to get better, in fact all have said they could be better. And they don’t mind being held accountable. The difference between me and the current administration or the current state school superintendent or my opponent is that I want, when we’re talking education reform, to give teachers a voice. I want us to also listen to the principal, listen to the superintendent, a parent, school board member. There’s going to be a difference in all our local schools, but for us to try to implement changes in schools from the top down — the changes are going to be implemented by the classroom teachers and the principals. If they don’t have a seat at the table, if they don’t have a voice in how we can do this, I don’t see how it’s going to be successful. So to cut to the quick, I just don’t see how you reform public education by scapegoating the teachers and public education. How do you get that voice into place? How do you put it structurally into the conversation? GREGG: If you’re governor, it’s the governor who appoints the state board of public education, not the state school superintendent, it’s the governor that does that. I can work with anyone. If Superintendent Bennett is re-elected, I don’t know if he’ll be re-elected or not, I’ve always had a history of working with Democrats and Republicans. I operate in an old fashioned way — I think we talk, we listen, we show respect. I think today that Washington, D.C. gridlock’s hit Indiana, where people say every issue is left or right. I don’t necessarily buy that. I tell people that are moderate Republicans, independents — if you see issues as left and right on a spectrum, I’m not your candidate, but if you see issues as right and wrong, good and bad, I am. And I think we can make education in Indiana better. The overall goal: make sure when kids graduate high school, they’re either career ready or college ready. College can be four years, it can be three, it can be a certification. I also think that our challenge for college is to keep it affordable for the students. And the other thing is, if we talk K-12 and college, I’m very proud that Senator Vi Simpson and I are the only two that have actually discussed and talked about Pre-K. We want to fully fund full-day Kindergarten across the state and we want to have the first Pre-K, early childhood development program. We’re one of six states that doesn’t have anything, and I’m proud of the fact that we’re the only ones advocate. Before we get too far from the takeover issue, what would you do if such a proposal came across your desk? GREGG: The takeover should only, only be a last resort. I know I just recently read in the Indianapolis Star how some of the takeover, I believe it was Howe High School that had gone to a private school [operator], that they were having fights break out and they weren’t be properly monitored and the Advanced Placement classes weren’t really Advanced Placement classes so some of these cure-alls that we’ve talked about have not turned out to be, maybe, the panacea that we thought it would be, it’s turned out to be more of a Pandora’s Box. So you’re saying the current, 6-year timeline that we have is sufficient? GREGG: I’m not saying the current 6 years — that, in many eyes, is too long. But there are signs that we can pick up before we get to that point where it could get to that 6-year watchlist for the takeover. I think our challenge is to identify it before it gets on it. We can do all this, but we can be a lot more inclusive when we’re talking about reform. When you’re doing reform without classroom teachers, even without parents, it doesn’t make sense. One of the things you’ve talked a lot about in your campaign has been re-emphasizing vocational education. GREGG: That was really my opponent that has emphasized vocational school. I have talked about is that in the last 8 years, we’ve basically dismantled vocational ed in Indiana, which is interesting. I can tell you from having been a president of Vincennes University — in ’03 and ’04, I was the interim president — we have many students that go to school, that go to college that aren’t aware when they go to college that there are opportunities to learn a skill, some really high tech things that are out there. They can get a two-year degree and go right into the workforce and make $60,000-65,000. Let me give you some examples: Laser optics, advanced manufacturing. The traditional tool-and-dime area where you use a tap and a screw system, it’s called, is something that’s out there and is possible. We need to do more in our high schools to at least remind our students that if a four-year program is not what they’re looking at, there are programs out there. When I travel around the state— not the top thing I hear about from employers, but one of the top things I hear about from employers, is having problems finding really skilled workers. So I think we need to do more to encourage some of our students that maybe don’t want to go to a four-year school to look at some of these programs. And then there’s even what I call the career-ready programs where the students get out of high school, they go into apprentice programs through organized labor to be a carpenter or a machinist — something that requires training, and they normally go through a 5 or 6-year program, and when they’re done they’re conferred an associates degree, normally from Ivy Tech. In terms of the terminology, your opponent has talked about vocational education when a lot of the schools talk about career and technical education. They don’t like the terminology ‘vocational.’ Is that an important distinction to make? GREGG: A duck’s a duck. It walks like a duck, it talks like a duck, it’s a duck. I’ve not heard that. I’m not aware of people not liking certain names or anything like that, I’m not aware of it. I’ve never had anybody mention that to me. I do have people speak concerns that, like I said, in the last 8 years, vocational ed has been put on the second burner and almost eradicated from a lot of our schools and I think that points to part of the problem that we’ve cut $900 million from our schools and our public universities — $600 million from K-12 and $300 million from our state universities. So when we’re talking in Indianapolis that we’ve got a budget, it’s not a budget from a growing economy, it’s a budget from cutting and more than half comes from cuts in education. So where do schools find the funding for more career-ready programs when they have had to cut so much in recent years? GREGG: That’s the challenge. That’s why I say, had there have been, in education reform, a school superintentendent, a classroom teacher — one of those great classroom teachers that inspired people — and a parent sitting at that table, we might’ve not gotten to this outcome. That’s why I talk about being inclusive because everybody needs to feel that they’ve got a seat at the table when we’re talking about changing something in schools because all the job opportunities in the world — and our job opportunities in this state are in agriculture, advanced manufacturing, logistics, life sciences, energy — all those job opportunities don’t mean anything if we don’t have a well-qualified and educated workforce. We’ve got to start giving a voice to the people in the classroom. Right now, we have degraded public education and you can see the output of that. The last seven years, the number of young adults going into being teachers has consistently dropped. The mantra from the other side — and particularly the Tea Partiers — is we want teaching to attract the best and brightest. Well how do you attract the best and brightest if you’re disrespecting them, blaming them, and you’re seeing the numbers go down, it doesn’t make sense to me? On college, I’m wondering how — when colleges have been really pressured by those who are currently on the Commission for Higher Education to keep tuition down — you’re going to deal with that. Universities are pinched between declining state revenues and increasing costs. How do you handle that? GREGG: I’m a realist, I have two children in college — one in a private institution in Indiana and one at a public institution in Indiana. It’s a challenge. Higher education in Indiana, thanks in part to Governor Daniels and the late Governor O’Bannon, is accessible. It’s everywhere — the main universities plus all the regionals of IU and Purdue, plus the 20+ sites of Ivy Tech all around the state. Anybody in Indiana can find a college within short driving distance to start taking classes. Accessibility’s not a problem. The problem’s affordability. That’s the challenge of this generation, of people my age all the way down to yours because we’ve got to do everything we can to hold the limit on the cost of higher education because when you see young adults graduating from college with $20,000; $40,000; sometimes $60,000 — if they’re going to graduate school — in debt. The debt they have is astronomical. And when we have a soft economy, I don’t know how they ever get out from under it. And let me tell you how that effects the rest of us: That means they’re going to have trouble buying a home, and that in turn effects the economy. Universities are great places, but we’ve got to reach a good point between the universities and the public on trying to see when we can hold the line, if we can hold the line. The best example that I’ve seen… I am an IU graduate, I have a bachelor’s from IU, and I’ve got a law degree from IU — I recently toured Ball State. They were doing a new physical plant for their heating and cooling. When they got their cost estimate back, it was 3 or 4 times, as I recall, well more than twice what they had estimated it to be. I don’t know if you’re aware of this, but they started many months on a geothermal system. They’ve got holes drilled all over that campus. Necessity being the mother of invention… they ran it by people and they said, ‘Yeah, it’s not been done in any place like this, but we don’t know why it can’t work. It’s been done in Western Europe and other countries.’ So they started doing it. They’ve now had visitors from all 50 states and almost 20 foreign countries. There’s things like this we have to look at. There’s another dichotomy — we always want new buildings for a university and they’re great for the economy because we’re building those buildings. Money’s backing the state’s economic chain. But by the same standpoint, do we need all these new buildings? Can we rehab or refurbish? I think part of it comes down to having a Board of Trustees that works in conjunction with the Higher Education Commission, realizes they’ve got a duty to provide not only a quality of education, but to keep a cost as low as possible. What some Senate Republican leaders argue is that the state’s higher education budget is at a level we can afford right now, and well within what IU or Purdue or the institutions are getting from the state in order to do an effective job. Do you agree with that statement or not? GREGG: I served in the legislature long enough that I saw the economy good twice and I saw the economy bad twice. And when it’s good, it can never be good enough that you take care of everybody’s wants because there’s a definitional difference between wants and needs. I think their needs got handled but their wants might not have always gotten handled. Conversely, when the budget goes down, we’re in tough economic times, I hear a lot of complaints as I travel around the state from parents, from students, but I also know that the cost of operating a university has gone up and see those challenges. Pre-K was one of the earliest positions you took. Why is that so important? GREGG: We’re one of six states that don’t. What everybody tells me — all the experts, anything you read — is that the more money you spend in the Pre-K years, the early childhood development, I’ve heard that for every dollar that we put in, by the time that student is through school, we’ve seen a $7 return on that. What it means is that if we spend this money before they’re in Kindergarten, then we won’t need aides working, possibly, with all the children we have now. That teacher will have freed up time to spend with some of the students that are ahead of the curve, as opposed to behind it. It showed great gains in other states. We’ve got two challenges. One, we have to make sure Kindergarten for full-day is fully funded. The reason why that’s important is that we need to make sure that when these students hit the first grade, they’re ready to learn. Because they’ve got to be ready to learn from that first grade on so they can compete in today’s market, so they can compete in today’s global economy, and when that child is 3 and 4 and 5, they’re like a sponge. They pick up so much. Another reason we did it, to be candid, is, being Democrats, this is something that benefits the middle class. If you’re low-income, there’s a Pre-K program out there. It’s called Head Start. It’s been around since I’ve been in college. I volunteered when I was in college at a Head Start, working with young kids in a classroom setting. That’s there for low-income, but the middle class, there’s nothing out there in Indiana that allows that, so we talk about Pre-K, but it’s not just because we’re wanting to give them a break or anything like that — we want those students to have the opportunity to learn so they can move forward. We’re long overdue. It took us over 10 years to get to full-day kindergarten. Governor O’Bannon tried doing that in ’97. It took us many years to get there. We’ve got to start talking about Pre-K now. We don’t know what it will cost. We’ve done what we think is a prudent and fiscally wise thing, for anybody — we always like to point out it’s the Democrats that are trying to watch the state’s budget — we are proposing a pilot program in probably 40 locations for probably 2 years. We want schools urban and rural. We want schools in the North and the South. We want schools that are consolidated. We want schools that are English as a second language. We want schools that are diverse. We want a good hodgepodge of every school so we can see what it costs to do that and then can extrapolate the data to see how much it costs so we can then go to the legislature and say here’s how much it costs, let’s work together and figure out a way that we can implement this. If you don’t have a cost in mind, do you have a number of kids in mind that you’re looking at? GREGG: We want to ultimately make it available to everybody, but the pilot program would be in 40 schools. So it would be limited to the classroom sizes in each one of them. That’s the limit, but that should give us enough data. When we did the home healthcare program in Indiana, which is something that allows senior citizens to stay in their homes and get meals and therapy, we implemented that in two counties — one urban and one rural — did that for, I think, 18 months, extrapolated data, and then implemented in in 92 counties. So what we’re talking about is the same thing. Unless you have a number, isn’t it difficult to make the argument to a Republican who has said in the past ‘We love Pre-K, we just can’t afford it’? GREGG: When we propose this when we’re in office, we will actually be able to give a figure as to what it will cost because there’s a state agency called Legislative Services that will put a number on what it would cost the state to implement that. If when we get, during the transition period, if Vi and I are elected, during the transition period, there’s hopefully going to be an audit to see how much money the state really has. If that numbers’ really high, there’s always possibilities you can ask for more. We’re trying to be prudent. When everybody in Indianapolis is saying we’ve got a $2 billion surplus, I’ll tell you two things: I served in the legislature in 2001, and in 2000, Gov. O’Bannon ran with the slogan ‘Thanks a Billion’ because he had a billion dollars in the bank. September 11, 2001, when America was attacked and the War on Terrorism began, our economy stopped… It stopped and it went down and it went down, down, down. That changed everything. That billion-dollar surplus, in no time at all, was gone because there wasn’t sales tax coming into the state, because you were having more demands on unemployment. And the bills for the state to keep the State Police, the State Highway Department, the Department of Environmental Management — the state’s part going to the schools, that has to continue, so that surplus was used. I saw that surplus shrink an enormous amount. People say ‘Oh, we’ve got $2 billion.’ Bear in mind one thing: We owe $1.6 billion to an unfunded pension for teachers and public employees in Indiana. $1.6 billion with a ‘B.’ So that almost takes it out. There’s a second we owe to: Unemployment insurance. When the economy was bad in 2007 and 2008, when the economy tanked — it’s not real good now — the state of Indiana owes $1.5 billion-plus to Uncle Sam on UI dollars. And those dollars are ultimately paid from employers and the state pays it back, but it’s still a debt the state owes. When the people are running around saying the state owes all this money — we’ve got some major obligations from before when I was in the legislature, when legislatures in the ’50s and ‘60s just decided they weren’t going to pay into some pension plans. You’re saying the pension issue is one of the things the current administration hasn’t done? GREGG: No. There was a new fund created in the mid-90s. That fund’s solvent. But the older fund is not solvent. And there is money that, since the late ‘80s, the legislature has paid additional funds to keep that fund solvent. But it still takes hundreds of millions of dollars a year that goes into it. I don’t remember the exact amount that goes into it, I apologize. But there is an amount that goes in every year — Gov. Daniels did it, Gov. Kernan, Gov. O’Bannon, Gov. Bayh, and it maybe even started under Gov. Orr, paying money back into work on this insolvency — but it’s still a huge problem and it does affect education because it’s the pension fund that goes to the retired teachers. I’d like to explain what it is because there are people out there who will say ‘It’s the teachers’ fault! Why should we be paying their pension?’ And the employers — if you put money into TIAA-CREF, you put some money in and your employer puts some in. The State of Indiana, for the teachers, when the teachers were putting their share in and the state was to pay the match as the employer does in private business and at universities — the State of Indiana did not pay the employers’ share in. That’s against the law if you’re a private individual, but the state didn’t pay it in. That’s how it became unfunded. The employees paid their share, it was the state as their employer that paid theirs. Should we not be running a surplus and instead “re-investing” that money? GREGG: As Governor, I’d love nothing more than to see that there’s a real surplus there, because then we could have a discussion with the legislature and with Hoosiers all around the state — what are our priorities. Is it K-12, is it early childhood, Pre-K? Is it money in our infrastructure — to finish road and bridge projects, maritime ports, airports, rail — do we need to be talking about these items? These are the discussions we need. But we don’t know how much money we’ve got. If you remember, in February, the state found $200 million, and in March, they found $300 million — that’s a half a billion dollars. We’ve got no idea if they’ve got a surplus or not, and the legislature is supposed to be conducting an independent study to find out what that surplus really is. We won’t know that until after the election, and depending on what it tells us, the first thing I’m convinced that we want to do is verify that number’s accuracy. All of these discussions are moot if there’s just no dollars there at all. If you misplace a half a billion dollars, why would you believe all these other numbers people are throwing around. I’m not here to play Santa Claus. Where do you stand on teacher evaluations? It occurs to me if you don’t support it — as your Democratic colleague running for Superintendent of Public Instruction doesn’t — that’s one of the biggest things you’d have to roll back. GREGG: Let’s be a realist. The Republicans control the legislature. The Democrat governor’s office does control that State Board, does control a lot of the direction of public education. Again, I’ve never met a teacher that didn’t want to be evaluated. I think the question is that they’d like some input in the evaluation and that wasn’t added. I’ve not known of any teacher that was given the opportunity and just to paint it bad and to say they’re all bad — that’s what Superintendent Bennett and the current administration has done — I find it hard to believe. They all can’t be bad. They all tell me they can be better, so why would you not allow them to have input in what criteria, how to figure the evaluations, have input in it, and see where we should go from there, but they were totally discounted. And they are the ones who are supposed to be making the schools better, and you’re not listening to them? You’re telling them what to do? … You get a lot more done when you work together, and that’s what we’re talking about. This is a recipe for gridlock, and if you like Washington, D.C., vote for my opponent. If you like gridlock, and you like people just fussing and fighting, and not asking for other advice, that’s fine — that’s not how I intend to govern. I intend to be open and get input from people and it’s all to try and reach a conclusion. But I know we’re not all going to reach a conclusion. Sometimes, the decision that’s going to be made is going to offend people or make people mad. That’s fine, I’ve worked for two Fortune 500 companies, been president of a university, been Speaker of the House. When it comes time to make the decision, I can make the decision. So do we stand by evaluations? GREGG: I do not think that the evaluations as currently done, without allowing teachers any input in the process is the way to go. One of the real criticisms that teachers we’ve spoken with have about the evaluations is that they’re afraid of how a lot of the testing data is going to be used. Don’t you think that has a valid place in these assessments? GREGG: Their fears are warranted. This current administration has declared war on public education. The day I’m elected is when the war on public education and public educators, our schoolteachers, quits. That fear of this high stakes testing is legitimate because there’s a mindset that wants to do nothing, I’m convinced, but constantly beat down our public schools. And I don’t think that solves the problem. I’m not a fan of vouchers, not one bit at all. Those are public tax dollars. When I was in the legislature back in the ‘90s, we actually passed a charter school bill. Current teachers probably don’t remember this — it was limited to the City of Indianapolis, under the auspices of the mayor, they were still public schools, collective bargaining, under control of the school board and the mayor, there was public input, teachers sat at the table. All kinds of safeguards. It was still a public school, just operated under a charter. A little different animal. Those have all been stripped away. It’s not the same animal. And that comes from this bias of not having teachers sitting at the table. It sounds like you’re not okay with current charters? GREGG: I’m not okay, we’ve seen charter schools in Indianapolis — one where the mayor was going to pull the charter back. They went to court to say, ‘No, you can’t do it.’ We’ve just had another one that was on the front page of the paper in Indianapolis. Every safeguard that has been placed on those charter schools, when it was passed with the support of Democrats, Republicans, public schools, public school teachers, superintendents, reformers, everything — a Republican state superintendent and a Democrat governor, those were the two at the time we passed the charter school bill — every one of those safeguards has been removed. And that bill, as it came through, was a good bill. We’ve just taken all the safeguards off. I don’t think that’s wise. GREGG: Well, we’ve taken everything off. They’re not longer really public schools in that sense. There’s no collective bargaining. They’re not necessarily reporting to the mayor. They’re outside companies. There’s no accreditation or qualities in many cases of the people teaching. It’s just been wide open. I understand people want our schools to get better, but I think that we’ve just ran from one side of the playground to the other, and I’m not sure that we shouldn’t have stopped somewhere in the middle.